The HRS groups information obtained by EPA from its Preliminary Assessment and Site Inspection into four predetermined categories or “pathways.” The pathways include: (1) groundwater migration; (2) soil exposure; (3) surface water migration; and (4) air migration. EPA then weighs the four pathways against three individual factors grouped into three categories: (1) the likelihood of a release; (2) waste characteristics; and (3) “targets” or nearby human population and sensitive environments. EPA next assigns numeric values to each pathways and plugs the numbers into a magic formula that spits out a score ranging from 0 to 100. Any site that receives a score of 28.50 or above must be placed on the list of sites that require the most urgent attention, known as the National Priorities List (the “NPL”). Since 1991, EPA has added, on average 30 sites to the NPL each year. That number, however, may begin to rise soon. Posted on February 11, 2016 by Mat Todaro and tagged EPA CERCLA Superfund Vapor Intrusion. On November 1, 2005, the U.S. Environmental Protection Agency (“EPA”) adopted standards and procedures for performing All Appropriate Inquiries (“AAIs”) under the Comprehensive Environmental Response, Compensation, and Liability Act (“CERCLA”). The standards adopted by EPA were developed by the American Society for Testing and Engineering (“ASTM”) and required parties purchasing a parcel of land to undertake a thorough investigation of the property’s history to identify potential sources of hazardous contamination. 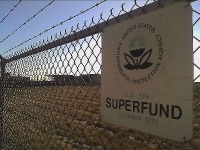 Posted on February 3, 2014 by Mat Todaro and tagged EPA CERCLA Superfund All Appropriate Inquiry Phase 1 Environmental Site Assessment.